WRENTHAM, Mass. 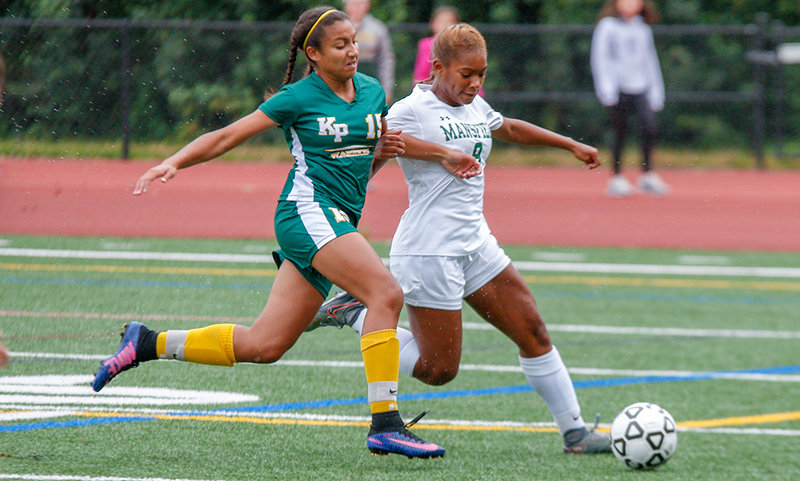 – The fireworks are typically saved for the end, but King Philip and Mansfield girls soccer wasted little game in getting things going in a highly anticipated matchup between two teams coming in undefeated. Both teams scored inside the first five minutes of the game, and by the time 15 minutes elapsed, each side had another bid hit off the post. But in the end, it was a relentless attack from the visiting Hornets that was the story, resulting in a convincing 4-1 decision over the host Warriors. Mansfield seized a 1-0 advantage in the fourth minute only for KP to tie the game just seconds later. However, the Hornets took the lead back in the 37th minute and cashed in twice in a second half that featured numerous chances to earn the two points. The pressure paid off early for Mansfield. Steph Kemp charged in on a through ball behind the defense, forcing KP keeper Taylor Butler off her line. Kemp was able to apply enough pressure and deflected the ball in behind. Freshman Maria Sevastos calmly tracked the loose ball down and tucked it into the open net for a 1-0 lead. But the advantage lasted merely seconds. A punt from Mansfield keeper Lauren Whitman was brought down by Snead with a terrific first touch, and the junior didn’t hesitate before firing a shot from just over 35 yards out, catching the keeper off the line for a 1-1 scoreline. Back on the other end, Kemp drew in the defense and then switched the ball over to Cassidy McMahon on the left side. The senior hit a one-time shot that looked destined for the back of the net but the bid clanked off the post and stayed out. Snead found Ally Stanton in the area in the 14th minute, but a nice sliding stop from Whitman forced a corner. On that corner, Layne found Snead at the back post, but her header hit the post and stayed out. KP nearly cashed in on another corner in the 25th minute, but Snead’s header was blocked on the line by Mansfield defender Kerina Geminiani. In the 28th minute, Layne drilled a 30-yard free kick off the crossbar. For Mansfield, it was a big boost to not let the Warrior offense gain momentum after an opening strike. KP had scored at least three goals in its last five games. Before the stroke of halftime, the Hornets were able to jump in front again. Bryn Anderson took possession and very intelligently switched fields in a quick manner. She found McMahon out on the left flank, and the senior centered for Kemp. Kemp calmly took a touch to control the cross and then deposited it in the back of the net for a 2-1 lead. Holding a 2-1 lead, the second half continued to belong to the visiting Hornets. King Philip’s best chances came in the 45th minute (Stanton’s chance at an open net blocked again by Geminiani) and in the 69th minute when Snead’s cross found Layne at the near post, but pressure from Mansfield keeper Caty DeMassi forced the one-timer high. Other than that, it was constant pressure from the Hornets attacking group. Mansfield continued to find space between the defense and used its speed to run onto the through balls. In the 51st minute, a simple lay off from Katie Garvin put Anderson in behind and she one-timed it past an oncoming Butler for a 3-1 lead. “We’re getting better every game,” Smith said. “And now we’re finally scoring. It’s been one goal, one goal, one goal and then all of a sudden we get four today. Kemp nearly made it 4-1 just two minutes later, chipping the keeper but KP defender Olivia Barry made a terrific hustle play, beating the ball to the line and keeping it out. With just under five minutes to play, the Hornets put the game on ice. On the right flank, Mansfield senior Erin Daniel found Anderson with a central pass. Anderson took one touch and unleashed a low shot to make it 4-1, putting a cherry on top of what was an impressive showing from Mansfield. “I thought we’d be able to come from the outside in against their defense, but that didn’t happen,” said KP head coach Gary Pichel. “Their defense shut everything down, and the opposite happened with our defense. They were much quicker than us and their through balls had much better touch than ours. They were able run through and connect with their speed, and they took us down. Our midfield play was not nearly as good as I had hoped for. That formation they had, it really did a good job against us, it broke us down in every aspect. On top of a great offensive performance, the Hornet back line of Daniel, Geminiani, and center backs Mikaela Maughn and Emily Vigeant was outstanding. Snead and Layne, two of the top players in the entire state, were virtually shadowed everywhere they went by the center backs. And Daniel and Geminiani provided the help when needed. Mansfield girls soccer (7-0-1 Hockomock, 8-0-1 overall) will attempt to keep its undefeated streak alive when it travels to Stoughton on Monday. King Philip (7-1-0, 7-1-1) will try to bounce back when it travels to North Attleboro on the same day.